According to new data from TeleGeography’s IP Transit Forecast Service, global IP transit revenues are forecast to fall six percent compounded annually between 2014 and 2021, from $4.9 to $3.2 billion. 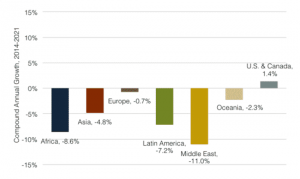 However, despite widespread declines, revenues will not fall evenly among all regions. While revenues in more developed markets will remain relatively static over the next seven years, those in developing regions will fall significantly. For example, IP transit revenues in North America will increase one percent compounded annually, while those in Europe will fall by one percent per year. In contrast, revenues in Africa and the Middle East will decline 9 and 11 percent per year, respectively. Two factors are driving this regional divergence—differences in the rate of price declines and differences in the share of Internet traffic exchanged via transit agreements. Although overall Internet traffic is growing fastest in emerging markets, Internet service providers in these areas are migrating from purchasing transit to establishing mostly free peering arrangements more quickly than those in Europe and North America, where peering is already common. For example, TeleGeography forecasts that the share of African Internet traffic exchanged via transit will fall from 84 percent this year to 62 percent by 2021. IP transit is much cheaper in the more developed markets of North America and Europe, and it often makes economic sense for ISPs in these regions to pay for transit rather than incur the cost of building infrastructure required to peer. Consequently, the share of U.S. Internet traffic exchanged via transit is expected to fall only moderately over the longer term, from 44 percent in 2015 to 39 percent in 2021. In addition to significant IP transit volume declines, developing countries will see steeper price reductions than more mature markets, further driving down revenue. The monthly price per Mbps for a 10 gigabit per second Ethernet (10 GigE) port in Africa, Latin America, and the Middle East is projected to fall between 27 and 29 percent compounded annually through 2021, while declines in North America and Europe will be more modest, at 20 percent compounded annually. Lower IP transit prices and more peering in developing markets will drive cost savings for ISPs and customers located in these areas. As carriers continue to expand their networks, ISPs in emerging markets will see increasing opportunities to peer outside of traditional hubs in Europe and North America.